to break in the new old NES i just got off of ebay i thought i’d start in on the classic ninja gaiden. i’d been interested in the game even back in the days when the NES reined supreme after seeing it repeatedly in the monthly list of top 10 most-played games in nintendo power, and my interest got an additional boost when i played through the game boy ninja gaiden game a couple of years ago. the ninja gaiden series is famous for its difficulty, so i was leery of starting the NES version of the game instead of the SNES remake which had passwords. i thought i’d just play through the first few levels to get a taster, but i got sucked into it and ended up spending the afternoon playing all the way to the final stage. the difficulty wasn’t too bad, esp. thanks to the infinite continues, although the game generally requires too much memorization and there are a ton of cheap deaths due to enemies strategically placed right where you’re most likely to jump. everything was more or less fine, though, until the final section (act VI) where if you die at the final boss (at the end of stage 6-3) you have to restart all the way back at the beginning of 6-1, which just ends up being a ridiculous amount you have to replay. i ended up beating the first part of the final boss, but after realizing that there was another boss immediately following i just couldn’t face starting all the way back at the beginning of act 6 yet again and just gave up, which is not something i ever do. but it’s kind of good that i did, because it turns out that there’s a 3rd part to the final boss battle, and that would have really sent me over the edge. it was hard for me to put the game on the shelf for the time being, completist that i am, and i’ve contemplated picking it up again, but i just can’t face having to slog through the whole game again and replay act 6 over and over again just to figure out the last two boss battles. the insane amount of having to replay previous parts of a game is a large part of what’s kept me from getting an NES again in the first place, and although i still think of myself as a retro gamer at heart i think this has made me even more cautious about starting NES games than i was before. as for the game itself, i was surprised at how much the mechanics rip off of the original castlevania, something that wasn’t immediately obvious from the game boy game i’d played. even the enemies almost all have analogues to castlevania, although the powerups in gaiden are slightly improved. i found the wall jumping ability to be underused and the graphics seemed hit or miss, particularly with the backgrounds, although the enemy designs in general are pretty good (despite being ripped off of castlevania). the music is quite good, which i’d been looking forward to from enjoying the music from the game boy game. the much-touted cinematic cutscenes are definitely impressive for the time, although the story is pretty flimsy. all in all, much as i wanted to like the game i just have to chalk this one up as yet another game that was noteworthy for the time but just hasn’t aged gracefully. but i’m still up for playing the sequel (and beating the original once my blood pressure has gone down some). – youtube videos of the intro, the ending, and some gameplay. echh. i’m way behind on everything these days. i’ve been meaning to start posting reviews of video game soundtracks for quite some time now but haven’t gotten around to it. this one will be nice and quick though. as you may have noticed, i finished and reviewed ninja gaiden: shadow fairly recently. my renewed interest in video games has gotten to the point where i need to listen to game music while i’m at work. game music has the added bonus that it does a pretty good job of keeping me going at work. nothing like some good ninja music to keep you debugging programs haha. of the soundtracks to the recent games i’ve played (many of which are available at the great, great, great galbadia hotel), ng: shadow is among my favorites. i’m a big fan of old school gaming, and esp. old school game music. they just don’t make ’em like they used to. 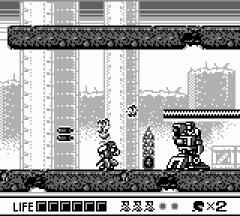 the music in ng: shadow is very much in the japanese platformer tradition and reminded me of the best of games like mega man. in general i’ve found that listening to the tracks in the video game vs. on a stereo is quite a different experience, and in this particular case there’s a percussion patch that sounds distinctly “squelchy” that gets overused. other than that, and the boss music that i definitely am not a fan of, the score is pretty strong all around. i’m not sure who it’s by though, so if anyone beats the game anytime soon please let me know who it says in the credits! i got this image from classicgaming.gamespy.com which has some good info on natsume as well as more info about the “shadow of the ninja” series. also, in my post about the game i pointed out the game page at ninjagaiden.classicgaming.gamespy.com which also has the code for the sound test. that site also has mp3s of the soundtrack. ROCK. so in the end i did manage to squeeze in one more game before the end of the year, finished this morning. i’ve been playing ninja gaiden: shadow off and on for a while, but hadn’t sat down and played through to the end. so i finally picked it up again yesterday. it’s one of those platformers which, as this good walkthrough so aptly describes it, consists mostly of “try-and-die gameplay”, i.e. it’s not too challenging, but you’ll have to play through it more than once to figure out the enemies’ patterns, etc. … although i suppose all platformers are like that to varying degrees. There’s despair in the skyscraper. awesome. haven’t played any of the NES games yet, but will def. be doing so … sometime!